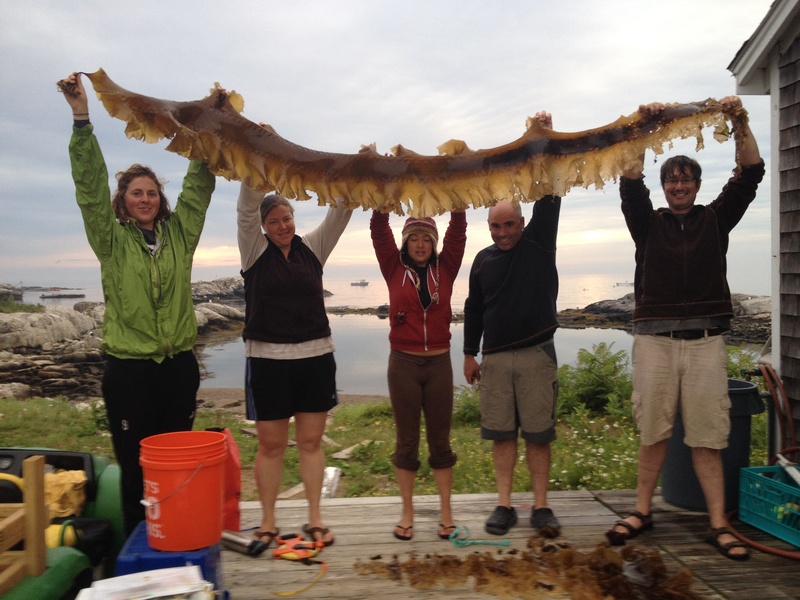 The mission of Shoals Marine Laboratory (SML) is to provide education and research programs that advance the understanding of marine and coastal ecosystems and development of sustainable solutions to environmental challenges. 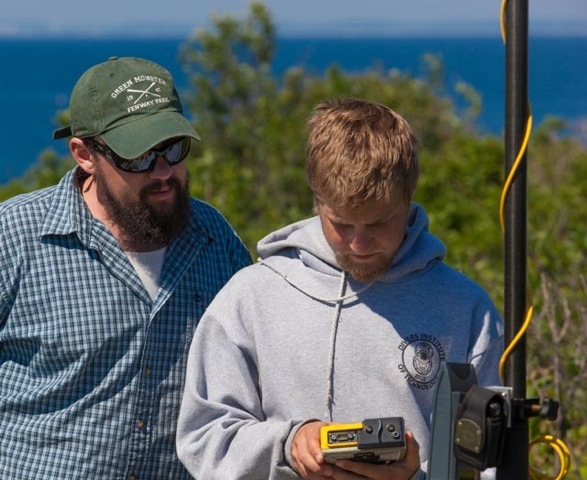 In May 2014, Shoals Marine Lab flipped the switch on its brand new Energy Conservation Building (ECB) -- the ECB houses an energy storing battery bank that powers SML's Appledore Island campus. This battery bank is primarily charged by the sun's energy using an impressive array of ground and roof mounted solar panels, but we continue to run our diesel generator as a supplement during peak summer months. 40 more solar panels will make a significant impact in reaching SML's goal to power the Appledore campus with 100% green technology -- this goal is within our grasp --won't you help us? Your contribution to this effort will steward SML towards a future without the need to burn fossil fuels to power Appledore's unique and fragile island campus. 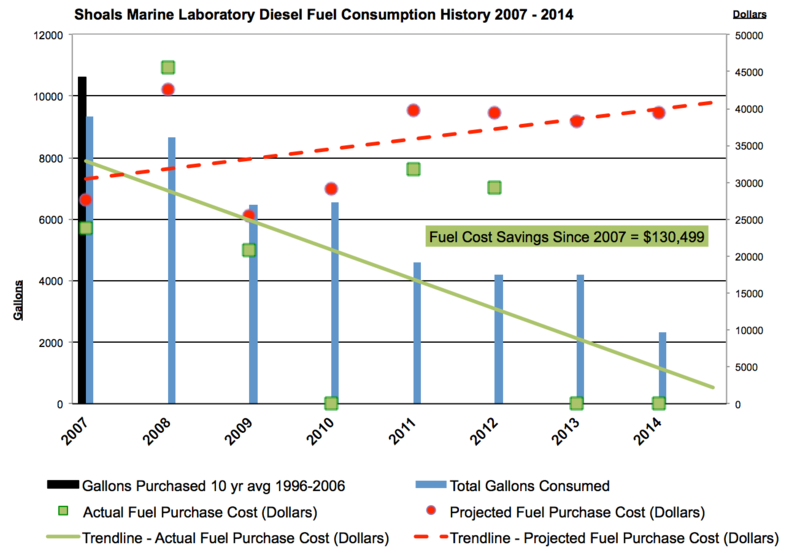 Shoals Marine Lab’s fuel consumption and fuel costs have plummeted because of the green technology upgrades set into motion in 2007 (see chart above). With YOUR support, we’ll complete Appledore’s solar grid, and provide sustainable, clean power to our entire island campus. A Window to the Sea Shoals Marine Laboratory on Appledore Island, Isles of Shoals, Maine is dedicated to undergraduate education and research in marine science and has been since 1966. 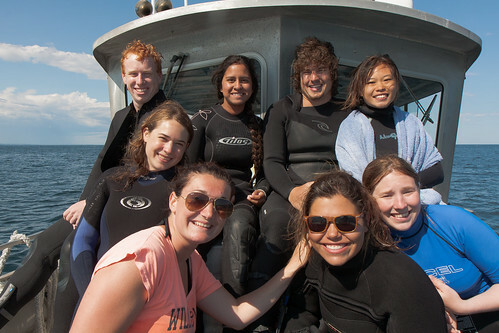 SML offers undergraduate students a unique opportunity to study marine science in the field with exceptional faculty from institutions throughout North America. Instruction at SML is based upon giving participants a truly "hands-on" educational experience. Class sizes are limited providing excellent faculty to student ratios. SML's curriculum is diverse; encompassing a variety of marine disciplines. SML is a seasonal field station located on Appledore Island. Lying six miles offshore from the Maine/New Hampshire border, this splendid 95 acre island is secluded, yet accessible. Only a one hour boat ride from Portsmouth, NH, Appledore is a natural laboratory and classroom. The rocky intertidal zone, seabird colonies, and the open sea are right outside the door at SML, providing participants with a direct route to the world of marine science. Appledore is the "Learning Island." Participants and faculty members can literally and figuratively immerse themselves in their explorations, free from the distractions commonly found on and around every mainland campus. A Sea of Opportunities Students from all over the USA and around the world enroll in SML courses and participate in summer internships. Credit is given through either of SML's parent institutions: Cornell University and the University of New Hampshire. A Path to the Future SML courses and internships provide rigorous training in a diversity of marine subjects. And perhaps most importantly, SML prepares students for careers in the fields of marine and environmental science. SML alumni are frequently quoted as saying, "I never worked so hard, I never learned so much in such short time, and I never had more fun!" Show you care about energy conservation. A little bit of sun goes a long way. Make the solar impact rise. A full day of sunshine means more solar power. Help us reach our peak and buy one solar panel. Heat things up with this way cool support. Save the day and power up Appledore Island.